Heat oven to 400°F. Spray 15x10-inch pan with sides with Crisco® Original No-Stick Cooking Spray. Unroll dough in pan; press in bottom and half way up sides of pan. Bake 8 minutes. Meanwhile, in 10-inch skillet, cook sausage, over medium heat, 5 to 7 minutes, stirring occasionally and breaking up sausage, or until no longer pink; drain. Meanwhile, place beans, garlic, olive oil and 1/4 teaspoon salt in food processer or blender. Cover; process 15 to 20 seconds or until smooth. Spread bean mixture over partially baked crust. 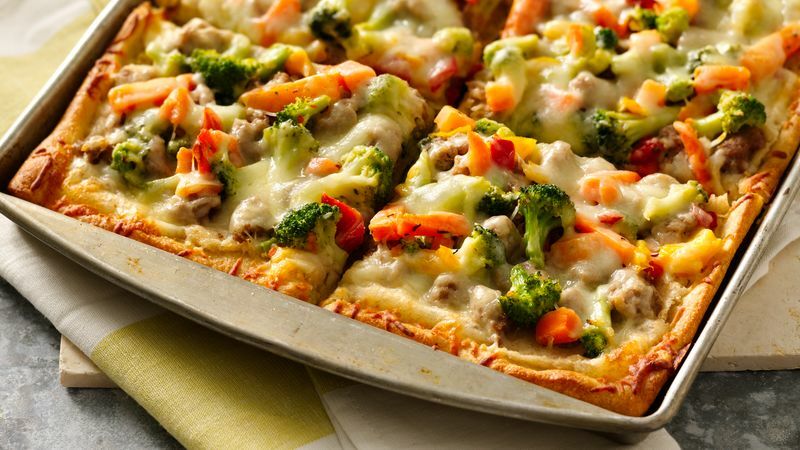 Top with sausage, vegetables and cheese. Bake 15 to 18 minutes longer or until crust is golden brown and cheese is melted.